Wrightington, Wigan and Leigh NHS Foundation Trust’s Apprentice of the Year has been presented with a second award. 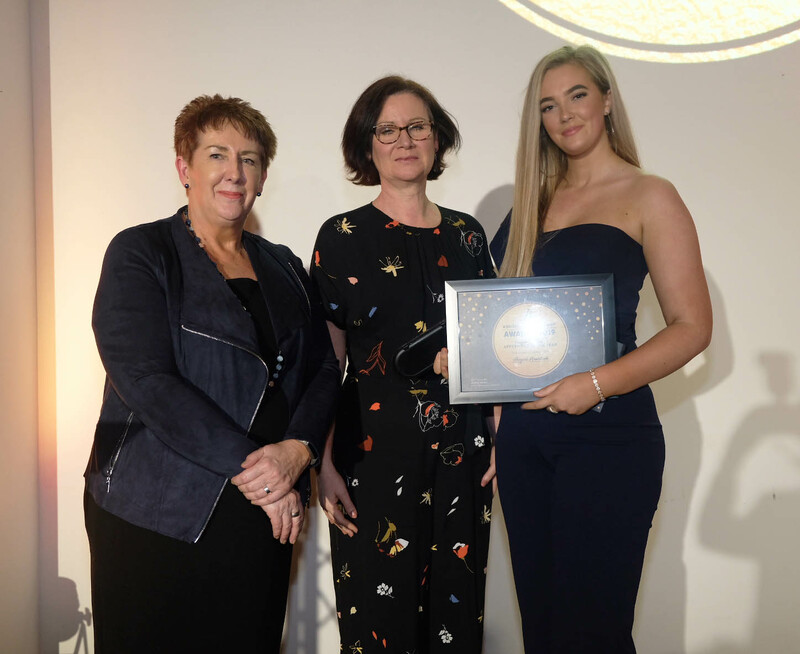 Abigail Henstock, 20, who works in the External Communications and PR department, attended the Salford City College Apprenticeship Awards 2019 at Media City where she was presented with the accolade of Creative and Digital Media Apprentice of the Year. The night was hosted by Allan Milne, Head of Apprenticeship and Business Development, Apprenticeships at Salford City College, with several members of staff handing out the awards throughout the evening. There were more than ten categories throughout the night for both employers and apprentices, with Abigail, from Warrington, seeing off four other nominees in her category. Allan said; “Abigail is a real inspiration. She is hard-working, determined to succeed and embodies everything we as a college want from our apprentices. “It was a pleasure to have her on stage with us at the awards speaking about her apprenticeship, she did a fantastic job. Christine Wiley, Head of Apprenticeship Delivery, announced Abigail as the winner and was handed the award from Debbie Ward, Head of Apprenticeships and Partnerships alongside Nic Hutchins, Principal Skills Manager (apprenticeships) for Greater Manchester combined authority. “I can’t believe I have been awarded two Apprentice of the Year awards when I have only been studying for my apprenticeship since May last year. “I feel very privileged and wouldn’t be here without the support of my team,” said Abigail.